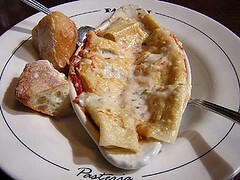 This cannelloni was great comfort food, and the sauce absolutely begged to be sopped up with the Pearl Bakery bread. Nothing challenging, a little fishy-tasting. Just good basic Italian. Note the plate: "pastaria" has an "e" where it shouldn't. I would have cried if I'd ordered these plates--but the overall effect is kind of charming. The Spousal Unit's Ziti Vegetariano was, again, very good basic food. He found the vegetables a little overcooked. I found the raw basil to be a bit green and jarring--though he really enjoyed it. And yes, those are his arms. Again, I was far too late with the camera here. The Chocolate Tartufo was the highlight of the meal. 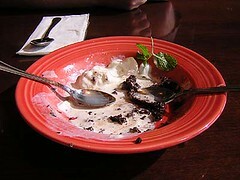 The cake was very nearly a pudding, and fantastic when paired with the ice cream. Suddenly, the SU was unhappy he'd finished his entire meal and was full. But he made room somehow for a few bites. 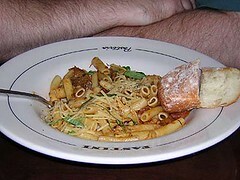 More than half the pasta dishes are vegetarian. To see this in a mainstream restaurant blew us away. Portions are human-sized. I'm sure I've mentioned a few times how I hate to be piled with more food than any human can or should eat in one setting. Pastini gets it right. Pastini is a family restaurant, and we saw several come in while we were there. The setting is easy-going, the service is very good, the prices are extremely reasonable, and the food is what I'm craving when I think Italian. This one's a keeper.